With the spring and summer travel schedule drawing to a close, we finally have had time to sit down and run the numbers collected back in June. As always, aside from the fact that we run our own GitHub rankings now, the process used for our bi-annual programming language rankings remains the same as when Drew Conway and John Myles White first looked at the question late in 2010. 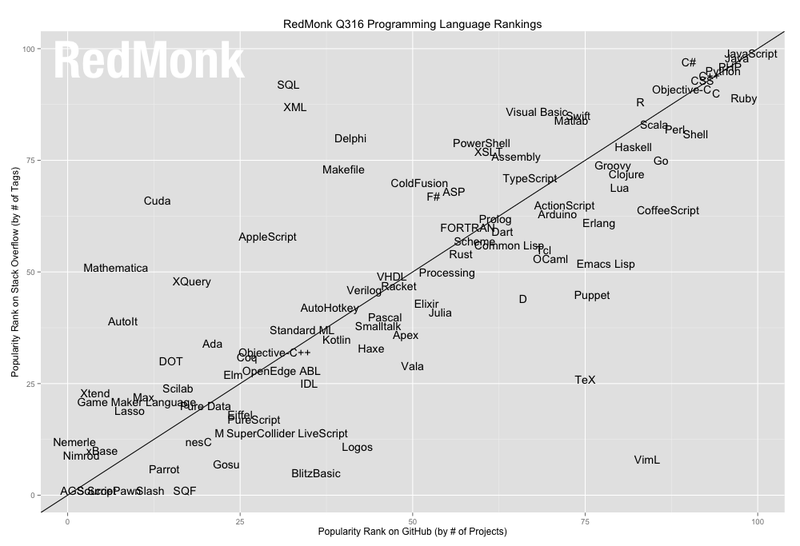 We have continued this analysis, comparing the performance of programming languages relative to one another on GitHub and Stack Overflow twice a year. The idea is not to offer a statistically valid representation of current usage, but rather to correlate language discussion (Stack Overflow) and usage (GitHub) in an effort to extract insights into potential future adoption trends. Historically, the correlation between how a language ranks on GitHub versus its ranking on Stack Overflow has been strong, but this had been weakening in recent years. From its highs of .78, the correlation was down to .73 this time last year – the lowest recorded. For this run, however, the correlation between the properties is once again robust. As with last quarter’s ranking, the correlation between the properties was .77, just shy of its all time mark. This is arguably noise, but we believe the correlation is worth noting at a minimum. We do have movement outside of the Top 10, however. Here they are in no alphabetical order. Elixir: Elixir jumped again this quarter, but to a smaller degree (2 spots) than last (6) run. Its trajectory and functional appeal make it a language to watch, but whether or not Elixir can sustain this momentum is the important question. As even very popular languages like Swift have proven, the difficulty of growth is proportional to the rankings themselves – as one rises, so does the other. It’s also worth noting that Erlang has not seen a bounce from Elixir; it was static this period, holding at 26. Julia: Julia’s growth has always been slow, but this is the first period in a number of quarters where Julia actually slid. Having moved up to #51 last quarter, it slid back to #52 for this run. This is not particularly surprising, as the language is not currently demonstrating the traction, visibility and enthusiasm characteristic of faster adoption rates. We’ll watch over the next quarter or two to see whether Julia can resume its climb, or whether it has stalled in a manner similar to CoffeeScript. R: Out of all the back half of the Top 20 languages, R has shown the most consistent upwards movement over time. From its position of 17 back in 2012, it has made steady gains over time, but had seemed to stall at 13 having stuck there for three consecutive quarters. This time around, however, R took over #12 from Perl which in turn dropped to #13. 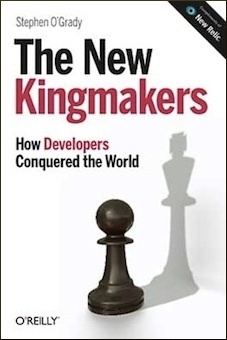 There’s still an enormous amount of Perl in circulation, but the fact that the more specialized R has unseated the language once considered the glue of the web says as much about Perl as it does about R. Which is irrelevant to R advocates, of course. Whatever the cause, R’s relatively unique Top 20 path is one for fans of the language to cheer. Rust: Interestingly, given that the past two quarters have anecdotally seen an uptick in Rust discussion, the language actually followed Julia’s lead and gave up one spot in the rankings this quarter. From a big picture standpoint, this is not particularly problematic, given that individual ranks should be taken with a grain of salt always, particularly so the further down the rankings a given language sits. That said, upward trajectories are preferable to the opposite, even if the actual rankings themselves are not to be obsessed over. Like Julia, it will be interesting to see whether or not Rust will gain next quarter or if it has instead plateaued. Swift: Swift at this point has become the canonical example for the inertia of incumbent languages. Have followed an unprecendented growth trajectory since its introduction, this run is the first in which Swift has not gained but merely held its position of #17. In Swift’s defense, it at least performed better than the language directly ahead of it, Haskell, which fell out of a tie with Go for 15th place into #16. But it’s clear that further gains for Swift will not come easily, and will instead be the product of widespread usage across an array of communities. As discussed in the last iteration of these rankings, Swift has opened up new avenues for growth beyond iOS development via its release as open source software and the embrace of third parties like IBM or Perfect, but these have yet to yield gains in new discussion or code sufficient to propel it forward in these rankings. We’ll be watching for signs of this type of new growth closely. As we did last quarter, this visualization will allow you to dynamically select or deselect languages at will, tracing their individual rankings back to the first runs of this exercise. In general, these rankings are experiencing less volatility over time. The Top 10 in particular is fairly static, and even within the Top 20 movement is becoming more limited. It may be, as mentioned above, that we’re at or near peak fragmentation, and that the Cambrian explosion of programming languages is leading to a predictable period of consolidation. We’ll look at this question in more detail shortly. Even if that is the case, however, it is not true that there are no interesting trends to watch in the programming language landscape. R’s continued ascent is interesting, particularly following the acquisition of Revolution Analytics by Microsoft. Another language with ties to Microsoft, TypeScript’s ascent is as notable as it is surprising, and whether Swift can pass Haskell and potentially even Go will be fascinating to watch. In the last few spots in the Top 20, meanwhile, there are suggestions that change is coming: Clojure, Groovy and Haskell all fell back this quarter. We’ll be back with you in two quarters to assess these and other questions. Delphi and Pascal are separate entries in the ranking, but what defines the difference between them? The two major Pascal compilers (Delphi and Free Pascal) are both Object Pascal compilers. So shouldn’t the Delphi and Pascal entries be merged into a single Object Pascal entry? I do understand that you want to find a way to measure “popularity”, but please don’t use StackOverflow community tag – it’s is _not_ a representative figure. Secondly using lines of code is yet another bad measure, because in a good language I can achieve the same with 10x less lines of code. It looks like maybe you started to write “in no order” and changed your mind, choosing alphabetical instead, but forgot to take out the word “no”. Do we consider CSS a programming language? I use it and I like it but I do not think it can be used for anything other than styles for HTML web pages. Please correct me if I am wrong. One thing which may not be factored into your calculations which would lead to skew: TeX has its own stack overflow @ tex.stackexchange.com which is where you’ll find the stack overflow activity, rather than in the main stack overflow. Sorry, did I miss a link to a fuller lineup? Is there any data on languages below 21? Just looking for the trends on a language I’m interested in that clearly, not many people are using. Interesting to see GO move up in the rankings once again. Year after year, the steady rise of GO is testament to the expressive power of a language that is forming the corner stone of Cloud infrastructure, whether it be Red Hat’s Openshift, Docker, IBM Cloud-Foundry/Bluemix or the industry wide migration trends away from Python/Java/.NET when it comes to greenfield and non-legacy focused DevOps, in developing cloud native applications and databases like the opensource ACID compliant CockroachDB being built with GO instead if C/C++. Why there is no SAS language listed? Interested to see that Lua (which recently celebrated a 30th (?) anniversary) ranks in the 70% range on both GitHub and Stack Overflow.